It's funny how cliches can be so true that people make fun of them. 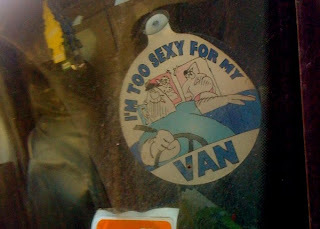 I am begging to guess that the man who rocked this van wasn't a looker. I know I am mean...but I have a 90% chance of being correct! If I see the van again, I will break in and steal the sign for your future mini-van...and just so you know, people who drive mini-vans are in a different category than those that drive full size vans...so you are safe for now...or at least until you get up to 5+ kids!